Clinton's memoir: A bestseller, a bomb or both? Washington (CNN) – When it comes to someone as polarizing as Hillary Clinton, book sale success is increasingly in the eye of the beholder. Clinton detractors and supporters are already spinning the sale numbers with little more than a week since "Hard Choices," Clinton's second memoir, went on sale. 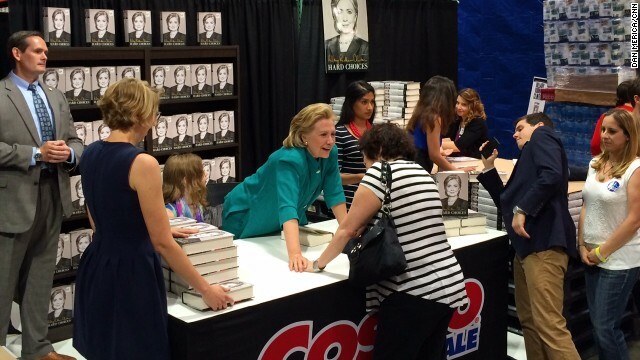 According to Nielsen Bookscan data – which makes up roughly 85% of all retail book sales – Clinton's memoir sold approximately 86,000 physical copies in its first week. Clinton's publisher, Simon & Schuster, told CNN on Tuesday that roughly 100,000 copies of "Hard Choices" were sold in the book's first week when you combine hardcover, e-book and preorders. If you ask Clinton's critics, her book sales show people aren't eager for more of the former secretary of state. The memoir's sales pale in comparison to Clinton's first memoir, "Living History," which sold 438,000 copies in its first week and Sarah Palin's "Going Rogue," which sold just over 467,000 copies in its first week. "What nobody can dispute is that the response to this has not been an overwhelming clamoring for Hillary outside for your colleagues in the media," Tim Miller, executive director of America Rising PAC told CNN. Clinton's supporters, however, see her numbers quite differently. Outside groups have trumpeted the book as a success and are highlighting the fact it landed atop the New York Times bestseller list for print hardcover titles. "Lots of Americans are interested in reading about Secretary Clinton's leadership and decision-making, straight from her," said Adrienne Watson, deputy communications director for Correct The Record, a pro-Clinton communications groups. One former Clinton aide even knocked Palin's book sales, calling them the "Fox News of book sales." Translation: The former governor of Alaska and conservative hero has a built-in, constantly interested market. But the pro-Clinton praise of "Hard Choices" don't come without caveats because the numbers are indisputable: Clinton's book is not flying off bookshelves, especially when compared to her last memoir. The argument coming from pro-Clinton supporters is that the publishing world changed since Clinton's first memoir. Borders, the brick and mortar book giant, closed in 2011 and the rise of Amazon has led to more e-book sales. Because of this, Adrienne Elrod, communications director for Correct the Record, argued that landing atop lists like the New York Times bestseller is what matters. Some publishers disagree with that. "New York Times bestseller is the lowest rung on the chart of expectations. It was going to debut number one regardless, given the hype and fanfare," Jason Pinter, founder and publisher of Polis Books told CNN. "There is no way it would have not debuted number one." Pinter also dismissed that publishing industry changes are to blame for Clinton's sales being significantly smaller than her last memoir. "I think it is a reason why the sales might be lower, but not a reason why they have been 70% lower," he argued. "I don't think that makes up for the drop in sales." In a column for the Daily Beast, Pinter argued that "based on its first week Bookscan numbers, the commercial reception for Hard Choices has been decidedly underwhelming," especially when you consider the frenetic book tour around the memoir. Pinter is right, Clinton has been everywhere in the last week and is set to continue her hopscotching tour in the coming weeks. She has held events in every American time zone, as well as in Canada, and has sat down for high profile interviews with all major TV networks. Whether the book is a success also depends on what other titles you compare it to. Bill Clinton's "My Life" sold over 1.2 million copies, Sarah Palin's "Going Rogue" sold nearly 1.4 million, Hillary Clinton's first memoir "Living History" sold 1.15 million and George W. Bush's "Decision Points" reached nearly 2 million copies. "Hard Choices" has some stark differences to those books, though. All of those books were first-time memoirs, which usually garner more attention. Take President Barack Obama's two memoir: "Dreams from My Father," mass produced in 2004 and "The Audacity of Hope," published in 2006. To date, Obama's first memoir has sold a whopping 1.8 million copies, compared to around 1.1 million for his second. And Clinton's first memoir was a different kind of book than "Hard Choices," a 656-page tome to American diplomacy and her time at State. "Living History," by comparison, contained much more personal reflection and made headlines for Clinton's memories of her husband's affair with Monica Lewinsky. Compared to other books seen as launching pads for presidential campaigns, Clinton does well. Former GOP presidential nominee Mitt Romney's “No Apology” sold just 42,000 copies in the first week, “Fed Up” by Texas Gov. Rick Perry sold a paltry 3,300 and Vice President Joe Biden's “Promises To Keep” sold a dismal 1,400 copies, according to Nielsen - well below Clinton's first week haul. "While Clinton's book clearly underperformed based on her and the media's expectations," Pinter said, "she clearly still has more drawing power (and book selling power) than the majority of other candidates in both parties." CNN's Brian Stelter and Brianna Keilar contributed to this report. It's been a homerun. Not only is it a bestseller, it has kept her name in the news for days. Bestseller for sure. She's promoting this book better than hip hop artists promoting their albums. I can see it now...its 2015 and a television ad pops up on the screen....Hillary's poor book sales proves she isnt qualified to be President....I wouldnt be surprised if this really happened. It's a dud... just like Hillary. An empty pants suit hawking a book of nothing new. Heck, she didn't even wrtie the thing. "The memoir's sales pale in comparison to Clinton's first memoir, "Living History," which sold 438,000 copies in its first week and Sarah Palin's "Going Rogue," which sold just over 467,000 copies in its first week." But what about palin's last book about the mythological war on Christmas? It sold like 7 copies and then they dropped the price to 8 cents and sold 3 more. I wish, I wish, I wish wish wish, that the republicants would put her on the ticket against Hilary. What say you.... your big bad momma grizzly (aka- 1/2 governor of state with a population of 104... it was her turn) against Hilary Clinton? Would that not be a hilarious debate? Unlike Biden who had to leave the gloves on, Hilary could highlight palin's ignorance (of everything) and humiliate her on a world stage (not hard for a woman to do- Katie did it with her terrible GOTCHA question.... "So, what do you normally read?" Aaaaahhhrrrggrgggg- She crossed the line, attacked our poor candidate. Unfair. Fire Couric!!! )- sound familiar it is the numero uno strategy used by republicants... we see it on here daily from a few... play the victim. Rudy NYC – " It's been a homerun. Not only is it a bestseller, it has kept her name in the news for days. " It has also reopened the discussion of Hillary's stupid vote on the Iraq War. The real measure, other than the dollars Hill liberated from the masses, will be the effect on Hill's ratings. Psst. Hey, Bill. The U.S. bought the troops home three years ago. Most of the people criticizing her for her vote for the war also voted in favor of it, too, based on the information presented by the Bush administration. Meanwhile, most people could care less about how she voted on the Iraq War. People are more concerned about jobs and the economy. If conservatives want to argue about her vote, then they will lose yet another presidential election by a landslide. Hillary be your next President! 1930's just over Hill. Food Stamps replace jobs. More Pajama Sales. Health Care on rise. Al together now, Hillary!, Hillary!, Hillary !!!!! Book Grand Slam !!! her book is a disaster. Just from reading comments from intelligent people (non democrat liberals). It sound like an excuse for wasting billions of dollars . Who cares! No one here is receiving a royalty check and Hillary has already been paid a hefty bonus. I finish reading Hard Choices and this is a great book, I recommend reading before you criticize it. I support Secretary Hillary Rodham Clinton, and looking forward to helping her become the FIRST Female President of the United States, if she decides to run. I think is pathetic when those that criticized the book have not even READ it, they go for what others tells them, SAD! GO HILLARY! look forward to meeting you next week in San Francisco.